What are our ultimate values? What is life really about? If we have been in a church at all, we know that the answer given is Jesus. However, there are times when the Jesus answer is superficial and shallow. There are times when we are tested to see if our lives are all about Jesus and his kingdom. Sometimes the other things that mean more to us need to be taken away. I am not sure that Mary, Martha and Lazarus would have said their lives were all about Jesus. I believe, like most ancient Jews, they would have said that their lives were all about God. There was a submission to God in the culture. Life belonged to God. If life belongs to God, he can take it away. It is his right. The issue of death presses into the issue of sovereignty. Whose life is it anyway? God has allowed us the privilege of making decisions as we live out life. However, above that, he is the Lord of life and death. He is the master of Creation. Although there is grief in this passage, there is a glorifying of God on a grand scale. People don’t completely die and then come back to life again like this. Once the soul has left the body, after three days, the body is not reanimated. God shows his power and his glory in doing this sign through his son Jesus. God’s glory is ultimate. God’s glory is the reason life is given anyway. God’s glory is shown through the life of his son and the signs that he performed. God’s glory will ultimately be shown when Jesus is enthroned on the cross. There is a mystery here of beauty, grief, horror, submission and glory. Is your life a complex mixture of these things? Jesus, I don’t think I would like to be Lazarus, experiencing death just so glory can be shown. However, I must have my priorities mixed up. I read Hebrews 11 and I see the passage through death as a symbol of faith. Help us to be more focused on your glory so that we walk bravely into the horror, the pain, and the darkness, so that your light might shine more clearly. How is God’s sovereignty shown in this passage? Why are Mary and Martha seemingly resigned to their grief and loss? Why does Jesus cry when he knows the outcome will be a resurrection? Why does God have to teach by using people as life and death illustrations? Why do people today think ease and comfort are signs of God’s glory, unlike some of the book of John? 1. Jesus knew what God was going to do – Lazarus would die, but Jesus knew that He would not stay dead. God had planned this event specifically to demonstrate Jesus’ power over death and bring Him glory. 2. 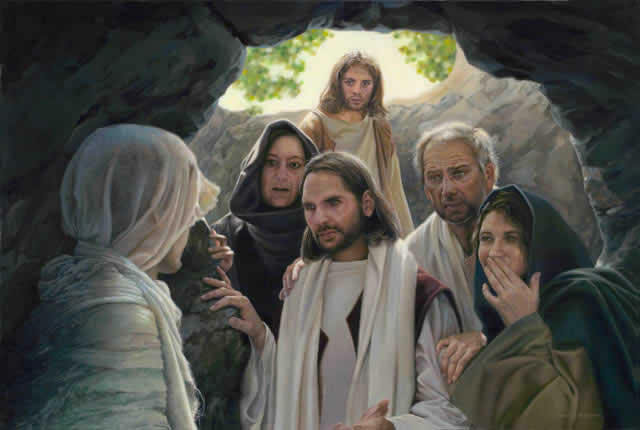 While you can clearly see deep grief displayed by the sisters (especially Mary, who falls at Jesus’ feet weeping), Their first statements to Jesus shows their trust in Him, “If you had been here, my brother would not have died.” They don’t know why Jesus didn’t come, but they do know that He is able to heal whom He wants to. Martha specifically expresses her faith that Lazarus will be raised at the resurrection and recognizes that death is not the end of existence. 3. The Bible doesn’t say. Some commentators have said that Jesus wept and was “moved in spirit” because of the people’s unbelief – that He was actually angry at the crowd for not believing that He could raise Lazarus. I respectfully disagree. What kind of a God does not allow us to grieve at loss? If Jesus was angry at their “unbelief” (though I see many examples of BELIEF in this passage), does that seem to imply that God does not approve of mourning a loss of a loved one? I believe that Jesus wept, not because He was mourning the death of Lazarus (since He knew He would be raised shortly), but because of the grief expressed by Mary, Martha, and the mourners. Hebrews clearly displays Jesus as our faithful high priest, who is able to sympathize in our weaknesses – Jesus experienced the full range of human emotions, and sympathy is one of them! 4. I don’t think that God always has to use life-and-death situations, but in this particular instance Jesus was clearly demonstrating His power to raise the dead. He had raised a little girl from the dead, but that was only hours after her death, before she was buried. Lazarus had been buried for four days; decay had set in and He was absolutely dead! 5. People today often view ease and comfort as sign’s of God’s blessing, but I don’t think we think about God’s glory much – it’s more about our glory! God is in control of the whole situation because he allows Lazarus to die, yet he still has a plan for his glory. It is heart-wrenching to watch a loved one suffer and die, to take their last breath. Mary and Martha are sad because they fear it is over and that they will never see their brother again. No one has been raised from the dead like this before. Jesus cries because, like I just mentioned, it is painful to watch the ones you love in pain. I think God uses life and death illustrations because He needs to get our attention. I am so stubborn as a sinner. If God did not allow so many of my past experiences to happen, I would not trust Him and love Him and know His faithfulness like I do today. 1. God’s sovereignty is shown in this passage by his performing a miraculous act at exactly the right time for the right group of people. Not only this, but the very event for which the miracle came about was orchestrated by God. 2. Mary and Martha have resigned to their grief and loss because they do not fully understand who Jesus is. Mourning is natural though and they do show they have some some faith. 3. Mary and Martha cry because they have lost someone. When Jesus cries, it is not because he has lost someone but because Mary and Martha have. God is sympathetic beyond my comprehension. It is not as though he was watching a sad movie and a tear came to his eye. Perhaps my theology isn’t correct here though. I do know that Jesus loves Lazarus more than Mary and Martha do still, even if my proposal is true. 4. This short life here is our only chance to be with God in eternity. We can’t grasp such a place, but when death and suffering come near us it does make us think more about the other side. Death and suffering are the most difficult issues in Christianity but they can also be the most comforting to believers. 5. To get close to the root of the problem, I think people generally want to avoid leaning on God which is necessary in times of trouble. Thus, they (myself too) pursue a life of happiness where God becomes another material good, a resource to pull from occasionally. 3. to show His humanity & the pain He felt? 5. because we don’t understand “the good” that God wants for us (Rom. 8:28) – we have our own definition for what we think is best for us. 1) God’s sovereignty is shown, because even though He allowed Lazarus to die, He later chose to bring him back to life. God was always in complete control! 2) Mary and Martha were deeply grieving over the loss of their brother, which I believe is natural! Whenever a loved one dies, there is a loss and a sadness knowing that they are no longer here. 3) It says that when Jesus saw Mary and Martha weeping, His spirit was moved and troubled, and He wept. Because of their sadness, Jesus also grieved and cried, because He felt the emotion of their loss. 4) Life and death are some of the most impacting illustrations, because they are authentic and everyone experiences them and feels them. 5) People desire ease and comfort, so they believe that is God’s glory and anything that is not comforting must not be from God. People can easily be blinded by what God’s glory truly is! God’s sovereignty is shown through Jesus remaining calm. He remained in control and knew what was going to happen. He used the situation to bring glory to God. Mary and Martha grieved because they did not understand what was going to happen. They believed Jesus could heal their brother but maybe they had not considered him being able to raise him from the dead. I think Jesus cried because he was upset. He was still human and felt pain as we do. We value human life. Sometimes I think God uses a death to get our attention. Often it helps us realign our priorities. God’s sovereignty is shown here through the power over life and death that Jesus has. He is not threatened by death. He has complete power over that which can separate us from God! Mary and Martha resign to their grief because they lost their brother! Death is not natural and is not the way that God meant it to be. They had decided that the best course of action for Jesus to take was for Him to come immediately and heal their brother. Jesus knew that His glory would best be shown by proving that His power goes beyond death itself! Jesus cries because He himself is human. He is fully God and fully man. His humanity felt the pain of loss. He empathizes with us! He KNOWS that this is not the way that it will always be. The mission of God is this: “To display the fullness of his glory and the riches of his mercy for the maximum enjoyment of his people.” Jesus allowed this situation to take place so that for generations to come His name would be praised and his glory would be fully displayed! He has victory over death, PRAISE THE LORD! Here, Jesus enters into the hopelessness of death, weeps, and turns death on it’s head. How beautiful that Jesus did not look at the situation with a secret smile and the knowledge that he was going to undo their pain. He knows the pain of death. Mary and Martha had lost their brother and Jesus hadn’t come. Now here he was, weeping alongside them. Christ, why were you too late? Why did you allow Lazarus’ sisters to experience the grief of death and the disappointment of your absence? “If you had been here, my brother would not have died.” Why didn’t you come? Your timing makes no sense in my eyes. I know, he had to die so you could show that you were more powerful than death. But you chose to allow the sisters to experience grief- you even grieved with them- to what end? I do not understand. But this is what I do know: you were acting for your glory. You did raise Lazarus. You entered into the pain of death. You understood. You didn’t use yourself as a pat answer for real pain, so why do we? 1. God’s sovereignty is shown through His power over death. 2. They believe that they will never see their brother Lazarus alive again. 3. Jesus weeps because He is grieving not only Lazarus’ death but the consequence of suffering that sin brings over His creation. 4. God uses people because we are made in His image. 5. People see ease and comfort as God’s blessing. Question – What can we learn about God/Jesus (his character, how he relates/responds to his people) and what can we learn about his people (their character and how they relate/respond to God) through this narrative? 1) As the purpose statement of this chapter and the book of John state, “these were written so that you might believe.” Jesus did these things so that we might believe. Belief and unbelief is evident in our words and actions, as was evident in the contrast of each of the people in this narrative. a. MARTHA – When they heard that Jesus was coming, Martha went out to meet him. She says, “Lord, if you had been here, my brother would not have died. But even now I know that whatever you ask from God, God will give you.” Jesus tells Martha that he is the resurrection and the life and that whoever believes in him will have eternal life. He asks her if she believes and she says yes! a. In response to Jesus weeping, the Jews said, “See how he loved him?” but some of them said, “Could not he who opened the eyes of the blind man also have kept this man from dying?” After he raises Lazarus from the dead, many of the Jews who had seen what Jesus did believed in him. In contrast (negatively), some went and told the Pharisees and what Jesus had done. 2) Walking in the Spirit sometimes requires us to do things that are at odds with our flesh. Jesus’ life was full of persecution and his final days were harder than most of us will ever experience. And he knew it coming! As well as the destruction of people he loves. I can’t imagine what a load he was bearing. He entered humanity to redeem us, in our current human form (not only in our eternal form), our mind, heart, volition, and body. He experienced the same things you and I do; he can relate personally to our struggles, temptations, fears, weaknesses, as well as our joy, love, passion, happiness, and so on. Prayer: Jesus, I believe that you are the Son of God, the Messiah, the promised one. Thank you that I can tell you anything, and I know you understand, can relate personally, do not judge as the world judges but you judge the heart, and you love me. Help me to grieve for those who don’t know you. Father, help me to set aside my own desires daily in order to submit my will to you. I know this doesn’t mean that I can’t have anything I want, for you long to give me the desires of my heart, so long as they are in accordance with your will. Like a good Father, you delight in giving your children good gifts. But we do not always know what is good for us. Help me to align my heart, mind, and will with yours, and use me for your glory. Holy Spirit, give me be bold and courageous for Christ no matter the cost. Amen. 1. That even though the worst thing humanly possible happened, God still came through and did the impossible and raised Lazarus from the dead. 4. He doesn’t have to teach, he chose to teach and I think that this was the perfect moment and he had a plan and a purpose for everything he is and was doing. 5. Because people think that wealth is a blessing..which it is..but most of the time people think they obtained their blessing of wealth based on something they did and therefore the results of what they deserve. In this passage we experience the depth of Jesus’ humanity as well as the power of his divinity. In his human experience, life had brought Jesus to know what pain, temptation and in this instance, what loss feels like. The emptiness, fear, and sorrow that a person feels when they have lost a friend or family member, is felt by Jesus at the deepest level. Although he knows that Lazarus will rise again, Jesus still weaps in sadness. 1. God’s sovereignty is shown in his power over death. Jesus makes sure to credit his relationship with God the Father for Lazarus’ resurrection. 2. Because they still don’t understand the extent of Jesus’ power. 3. He sympathizes with the pain of the people he loves. 4. I suppose it is because experience is one of the most effective teachers, and he realizes that this is the way they will best understand and internalize his love for them, his relationship with the Father, and his ultimate power. 5. I can only assume they think this because they want it to be true. People, especially in the materialistic West, are most attracted to a Jesus who will give them an easy life and material blessings as long as they live a good life. “If life belongs to God, he can take it away. It is his right. The issue of death presses into the issue of sovereignty. Whose life is it anyway?” I think the problem of evil is one of the biggest challenges for people to believe in God or to accept His existence and sovereignty. I know some who believe He exists but feel they cannot love or respect Him because of what He has allowed. However, I think the discussion of God’s sovereignty, our priorities, and what life is really about or who it belongs to speaks to this issue effectively. It does not negate the sorrow and pain, but it reminds us that it is not actually about us anyway, and that God is God and we are not, and it is His will, not ours, that is to be done. This is very, very hard to accept particularly in difficult circumstances, because we are self-centered and want our own comfort. Almost all we do is with the purpose of making ourselves comfortable and better of. It’s also hard to communicate to others who are in pain. And yet, I think in those moments of pain and having no other choice but to surrender, we find that we know God on such a deeper, more intimate, and sweeter level than before. It seems there is beauty in the weeping after all, difficult as it may be to realize. 1. How is God’s sovereignty shown in this passage? Even in the actions that seem counterproductive, God shows control over the situation. And then of course in the actual raising of Lazarus, God shows his sovereignty. Only God has power over death. 3. Why does Jesus cry when he knows the outcome will be a resurrection? This may be pure speculation, but maybe he is grieving that there is such evil in the world as death, or perhaps because he knows this will be him in the tomb in not too long (despite the knowledge of his resurrection). 4. Why does God have to teach by using people as life and death illustrations? To glorify Himself and show him to be truly powerful over death and to be the only giver of life. 5. Why do people today think ease and comfort are signs of God’s glory, unlike some of the book of John? People create their own version of God in their head, a God only of love and sweet fuzzy pleasantries. They forget their our God is one of power, wrath and might. God is God over all things, even death. 1. God shows that he is the ruler of time, health, life, and death. He chooses when we are born and when we will die, and everything that comes in between. 2. Mary and Martha grieve heavily because they have lost their brother for the remainder of their time on Earth. More than that, I am sure that they were confused as to why Jesus had not yet come. 3. I think Jesus cries—weeps—because while he is God and has the power and knows the outcome, he is human and therefore sympathizes with us in our weaknesses. He is grieved at pain and loss and empathizes with the sisters who are hurting so severely. 4. God teaches people by using life and death because these are the two things that impact us the most. 5. People think that their idea of good is God’s idea of good. They think that he should show his glory by doing what we deem as good. When really, often the best thing is to have a wanderer’s heart be brought back to him. In our comfort and ease do we rarely seek God. As a pre-emptive note, the material of my Romans, Apologetics, and Methods of Teaching Bible class have converged and overlapped in surprising and wonderfully intentional ways in the past weeks, and that alone I think is a tiny picture of God’s sovereign control over all things. On the heels of a Romans lecture about God’s sovereignty, I come to this passage. God’s sovereignty is shown in this passage in that, while Jesus is deeply affected by and mourns the loss that those around Him are experiencing, I do not think that He is baffled or surprised by Lazarus’ death. He knew what would happen, He allowed it to happen, and, in a real-life example of what will be written by Paul some thirty years later, He works good from the tragedy of Lazarus’ death. Martha and Mary are resigned because what other hope do they have? They do not allow themselves the hope- or at least, they do not communicate the hope- that their brother might once again return to life. I believe that Jesus cries because He truly is affected by the heartbreaking mourning and despair, and the loss, that those around Him are experiencing. I am unsure how His sovereign knowledge of Lazarus’ impending resurrection affected His own mourning, but I certainly believe that He as truly saddened when He wept. God is His sovereignty is able to use anything to shape the hearts of His children, and that includes humans. Although often, when His movement and sovereignty touch too close to our hearts, His work feels more raw, chaotic, and overwhelming than anything else. I suppose peoples’ hearts are drawn to ease and comfort, and we hold onto the hope that His way for us, and the way that He is glorified, might somehow be free of the trials and stumbles that are so clearly foretold and depicted throughout the Bible. God had a plan over this situation and he had absolute control over it. He allowed Lazarus to die, so that Jesus could bring him back to life and display His glory. Mary and Martha were sad that their brother had died. They do not understand Jesus’ power and are confused as to why he did not come sooner. In this situation, using life and death to teach was effective because it more fully revealed Jesus’ power to Mary, Martha, and Lazarus. They were able to see that Jesus had power over death, and that he was in fact from God.